Adam's practice primarily focuses on serving clients in the commercial/residential services and healthcare services arenas. In his commercial/residential services practice, Adam assists in defending products liability, premises liability and general liability cases on both a local and national basis. Within the healthcare arena, in addition to focusing a significant portion of his practice on risk management issues involving long-term care facilities, assisted living facilities and home care agencies, Adam has also developed a focus on defending Section 1983 civil rights actions alleging deliberate indifference to medical needs. Clients express appreciation for Adam's accessibility, practicality, and commitment to achieving their organizational and personal goals. Adam has extensive trial, deposition and mediation experience, giving him the first hand ability to be effective in and out of the courtroom. Adam has tried and arbitrated matters in Illinois as well as New York, Virginia, and California, on a pro hac vice basis. He has also presented arguments before each United States District Court within Illinois, as well as the Seventh Circuit Court of Appeals. Clients find that Adam's experience before each of these tribunals assists them with further understanding potential jurisdictional and venue specific advantages and pitfalls that may arise throughout the tenure of a litigated matter. Adam has spoken and provided Continuing Legal Education seminars on the topic of incorporating the wireless world into the legal profession. Adam is a member of the firm's Hinshaw University Planning Committee, which plans and produces the firm's nationwide attorney training and development programs as well as continuing legal education programs. Outside of the firm, Adam is an active board member of the Anti-Defamation League (ADL), having previously served as a co-chair of its young leader development program. He currently serves as co-chair of the associate board and was appointed in 2016 to serve on the Management Committee of the Chicago/Upper Midwest Regional Board. 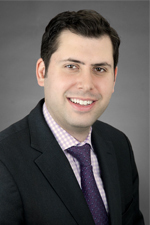 Adam also serves on the associate board of CJE SeniorLife and is a member of the Chicago Bar Association as well as an alumni member of his undergraduate fraternity, Sigma Alpha Mu. Adam holds an undergraduate degree in Political Science and Criminal Justice from Indiana University. He earned his J.D. from Loyola University Chicago School of Law, where he graduated with a specialized certificate in advocacy. Adam lives and works in Chicago. He is an avid fan of the Chicago culinary scene and can always be a trusted resource for a great restaurant recommendation.